It is quite depressing to hear what has been said lately – by government officials and some others – about how so many are leaving the civil service, how we must essentially seduce them with money, and how much exactly (down to the last dollar) we should be paying them to stay in service of their country. As I said in my blog, one glaring aspect missing in this whole discourse is the question of what kind of leaders we have and we want to have, actually. It’s a simple question – “Why’re we like that?” – but it got me thinking about fundamentals. Recalling the generation which my mom grew up in, our leaders then were men and women of real passion, drive, humility and nobility – with nothing more than a desire to help their fellow men survive. Of course, our separation from Malaysia and being thrown into the “deep end”, as it were, without any natural resources to exploit economically, no doubt contributed to the very human desire and instinct to survive. Thus, our leaders then had to dig deeper within themselves to succeed. And they did so admirably. 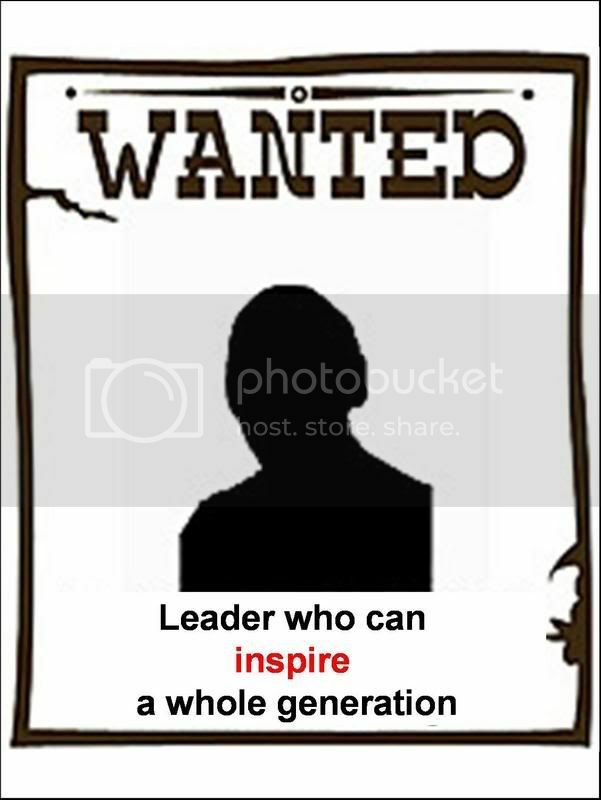 So, there is one thing which I find missing between our present leaders and our pioneering leaders of the 60s and 70s. And that is : The ability to inspire. When we speak of national leaders in government, we must have people who can reach into your psyche and inspire you from within. The question to ask is therefore: How many of our present leaders can do this? It is all fine and good to be able to provide data, figures, charts and numbers to back up a policy or an argument. Nothing wrong with that, really. But when we talk of leaders, we must also keep in mind that they must be quite different. The proverbial “fire in the belly” comes to mind. Even Lee Kuan Yew himself was concerned that new PAP leaders do not have that – because they do not go through the ‘baptism of fire’ during an election. And that, in my opinion, is where the crux of the problem is. While we may think that civil servants leaving the civil service is a matter of dollars and cents, I prefer to see it as a political issue. How so? The fact that the PAP – both as an all-encompassing government and as the biggest political party in Singapore – finds it hard to get people to join them tells me that there is something inherently wrong with our political system. My guess is that Singaporeans may not want to join the PAP or the government, but they will do so if the system is different. Men and women can be inspired to step forward without even thinking of monetary compensation. (Lets not go into the issue of them being paid “adequately” because there is no question of that.) Even though we are a country which is perceived to worship the God of M (Money), I do not believe that our people cannot be inspired to step forward in spite of that. Indeed, the government itself had praised Singaporeans for stepping forward during the SARs outbreak, when the New World Hotel collapsed in the 80s. Many Singaporeans stepped forward to help the Indonesians when the tsunami hit. There are also many Singaporean volunteers in diverse areas such as the environment, aged homes, homes for the disabled, and so on. And look at the hundreds of thousands of NSmen serving the country. And also look at the opposition parties’ members who do what they do for nothing more than a belief. And this is where the problem is. “Leaders” who want , essentially, to have the road paved for them, and all “impediments” removed before they step forward. And when this cycle of thought continues, as it has and does, we have a whole set of leaders who have this same belief. That is, they are looking for new “leaders” who do not want to step forward until and unless “as many impediments as possible are removed”. “Leaders” who are afraid to put themselves forward – but who want multi-million dollar salaries. It is a political problem. It is a political problem which, long term, can only be solved with changes to the political system. And yes, I am talking about the GRC system, the media, the electoral process and all other attending issues. We need a leader who can inspire others to step forward in the noble idea of doing something for their country. We need leader(s) who truly dare to change the system – because it is necessary for the country’s survival, even if it means diminishing the power of his/their own party. But in order to have such a leader, the leader himself must be put through the baptism of fire. And there is no better “baptism of fire” than the electoral process – one which is robust, rigorous and competitive, one which is fair – and seen to be fair. Only then perhaps, would our leaders – duly elected – find that serving the people is something which is indeed noble and totally satisfying to the human desire of seeing to his fellow men’s well being. And his personal example would inspire a whole generation of Singaporeans. Just as Lee Kuan Yew did. And that, I would say, is more of an accomplishment than a multi-million dollar paycheck. Just ask our pioneering leaders.